So I'm going to be completely honest here, last month was a bust. I achieved one goal, the end. But you know what? I'm okay with that. Sometimes life gets too crazy and what you thought would be accomplished, doesn't get done. I'm giving myself some grace here. 1. Find a no-sugar recipe for Pumpkin Spice latte, or pumpkin bread (or pumpkin anything). I found one; haven't made it yet but I can safely mark this one off the list! 2. Write 5000 words on a secret project. I did get words written, just not 5000. That may've been a bit of a high goal since I'm just getting back into the routine of writing. 4. Put my books back on bookshelves. Nope. I have no excuse, we had beautiful weather but still didn't manage to get this finished. 5. Paint three more paintings (or more!). I got one more done, well that's a 1/3 of the goal! Now on to October's goals. 1. Rework my wardrobe for the fall. You know I love doing this! 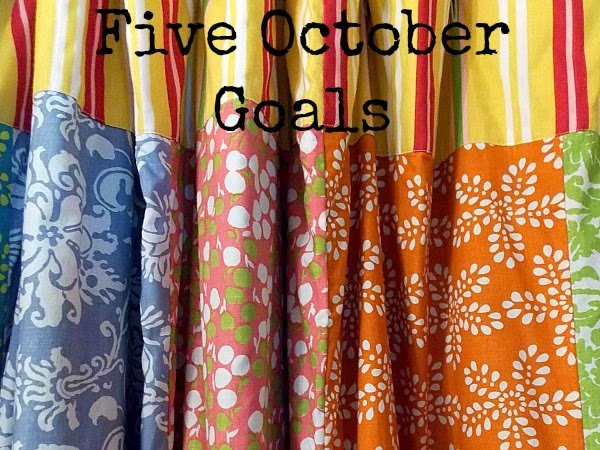 I didn't get a wardrobe capsule done for September, but maybe this goal will help me show you one for autumn. 2. Write every weekday. I'm not setting a number on how much I write this time. I simply want my goal to be sitting in the chair and writing. 3. Coffee on the porch. I do this in the Spring when everything is warming up and feels delicious after the cold, but I also enjoy doing it when the heat of summer fades and the cool of autumn is a welcome relief. There is nothing sweeter than having hot coffee in the morning wrapped in a blanket sitting on the porch. I love you, Fall. 4. Create something autumn-y. I want to say a painting but also want to give myself free reign on this one. Maybe a wreath or something from the kitchen? 5. One fun family adventure. There are so many to choose from: the fair, pumpkin patch, hayrides, gatherings by the fire pit....I could go on. What about you, how did your September go? What are you hoping to do in October? Aww, #2 Thank you, Alyssa. :) #3 I definitely will! #5 Oh RIGHT, that sounds super fun! I think that's a much-needed goal, Jema. Creating a culture of gentleness gives us freedom to try things without fearing failure. You go, girl!